Loot released from a container. Loot is the collective term for various items, abilities, and currency that can be found or awarded to Guardians for completing quests. Before being collected, loot appears in the world as glowing polyhedra. Defeating bosses will reward Guardians with rare loot, such as Exotic weapons and armor. Loot can also be found in chests hidden around the world; many include Glimmer, but some also include a piece of gear. Items and weapons may be traded between player characters under a single account by use of a vault, armor can only be used by the class it is designed for, at this time nothing can be traded between different players within the Tower. See Weapons. Guardians can carry primary weapons, special weapons, and heavy weapons. 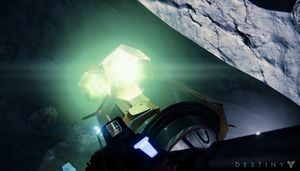 Engrams can be collected from bosses, random enemies, or chests. Engrams will appear in a player's weapon or armor inventory. Consumables are one-time-use items that grant various bonuses. Guardians can carry 15 consumable items. Ammo Synthesis: Replenish ammo for one weapon. Has a 5 minute cooldown after use. Weapon Telemetry: Speed up the upgrade progression of a weapon for 30 minutes. Can be purchased from Xûr, Agent of the Nine or the Gunsmith, Banshee-44. Glimmer Multiplier: Draw more Glimmer out of enemies when killed for 10 minutes. Experience Multiplier: Get more experience out of enemies killed. Artifacts: Dropped by Majors or Ultras, sell these to the Cryptarch for two hundred Glimmer each. Cosmetic: Cosmetic consumables with varying effects. Materials are used in upgrading equipment. Materials can be found out in the wild, as rewards for Public Events, or from disassembling items. Guardians can carry two hundred materials. Salvage Materials: These are acquired by disassembling Uncommon or better armor and weapons, which are used to upgrade Rare or better armor and weapons. They are also materials acquired in Salvage Missions. Planetary Materials: Acquired by finding resource nodes or opening loot chests on planets, or purchasing from the Vanguard Quartermaster Roni 55-30. Completing the Daily Heroic Story Mission or a Bounty for Patrol missions also yields ten materials from that planet. Used to upgrade Legendary or better armor and weapons. Legendary Materials: Acquired by completing high-level activities such as the Daily Heroic Story Mission, Nightfall Strike, or in chests in Raids, or disassembling Legendary armor and weapons. Also a potential reward for Public Events. Used for the final set of upgrades on Legendary armor and weapons. Exotic Materials: Acquired by purchasing from Xûr or disassembling Exotic armor and weapons. Used for the final upgrade on Exotic armor and weapons, as well as for Ascending or Infusing them. Summoning Runes: Acquired from killing Taken lieutenants. Used to summon the Court of Oryx at the Hall of Souls on the Dreadnaught. Skyburners Materials: Acquired from killing Cabal Majors on the Dreadnaught. Used to do specific activities and retrieve special rewards. Quest Materials: Found only when certain quest are active for you to complete. Soliton Flare- Found in Helium Filaments deposits on the Moon. Available only during the quest A Sword Reforged for the Raze-Lighter. Zeptocyte Core- Found in Spinmetal leaves on Earth. Available only during the quest A Sword Reforged for the Bolt-Caster. Relic Crystal- Found in Relic Iron deposits on Mars. Available only during the quest A Sword Reforged for the Dark-Drinker. Crafting Materials: Acquired by looting chests on the Dreadnaught and used to craft specific weapons. Mission rewards are items collected from completing missions. These can be turned in to the Vanguard for rewards. Ten mission rewards can be carried at once. Current Bounties are stored as items in a player's inventory, which then have to be returned upon completion. A player can carry five Bounties of any type at any one time. These can be abandoned at any time to free up slots and, if they are still available from the Bounty Vendor, picked up again with all progress reset to zero. See Weapons. Guardians in Destiny 2 can carry Kinetic weapons, Energy weapons, and Power weapons. Phaseglass Needle, Dusklight Shard and Alkane Dust renders. 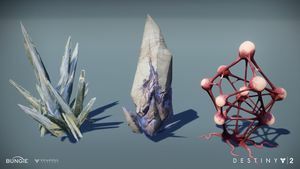 Planetary Materials: Acquired by finding resource nodes or opening loot chests on planets. Redeemed for reputation with a planet's Public Sector vendor. Dismantling Materials: Acquired by disassembling various pieces of gear and weapons. Rare gear always produces one unit of Gunsmith Materials, and Legendary and Exotic gear produce 3. Legendary gear also produces 3 units of Legendary Shards, and Exotic gear produces 5. Activity Tokens: Acquired by doing activities and opening chests on different locations as well as doing playlist activities. With the introduction of Update 2.0 and Forsaken, Tokens are no longer granted upon completing activities, with the exception of Crucible Tokens, Vanguard Tactician Tokens and Iron Banner Tokens. ↑ You can only hold one of each at a time in your character's personal inventory.